Today is reveal day for The Secret Recipe Club! I wonder who got my blog? This month I was assigned Nestlé Kitchens. This is a collaborative blog about good food, and good life. Three bloggers currently contribute to this blog and I had no idea where to even start looking for something to create for today’s dish. Did I want to do a make a drink or something sweet? Or maybe make something for a main course or to entertain with? Or maybe a side dish or something for the holidays, which are looming? I decided to click the random post button and see what the blog decided. And I was lucky! This is a dish I have been wanting to try, ever since my soup recipe I did using ribs. I have made one other short rib recipe, but I have never tried braising them following someone else’s recipe. Chris is a mother of triplets *gasp* and writes recipes for the world’s largest food company. Nestlé products are readily available in South Africa and I am very familiar with them. It made me feel like I already knew Chris before I ‘met’ her through this recipe. I have some short ribs in my freezer and I have been debating on what to do with them. I was sold on Red Wine and braised (then again, I’m always sold on red wine!). I’m visiting you through from SRC Group C. A little gee-whiz info, I had my very first visit to SA this past June, I can’t wait to go back! Oh my, these look so good! I’ve been tossing about the idea to make short ribs lately, I think I will have to grab some and make yours this weekend. are they a cheap cut for you? This is my first participation in the SRC, and it was fun to see who got my blog and to reveal what blog I got. As for your short ribs…yummy! Love me some short ribs for autumn/winter dinners. Braising meat yields such tender off the bone results. My grandson would be drooling over these, Tandy. He is potty about ribs, and yours sound delicious. What a wonderful sounding recipe with the port, vinegar and wine I can only imagine how delicious. I so love pork belly so I will check it out for sure! What’s that you ask? Oh, yes, I’m drooling. That looks amazing, Tandy! When it cools down a bit, I’m definitely going to have to make this. Gorgeous! I keep meaning to make short ribs, but still haven’t. Thanks for the encouragement! I keep seeing all sorts of red wine sauces out there, sounds like a good fall flavor to cook in! And horseradish mashed potatoes still sound amazing, I have got to use horseradish more often, I love it so much, but haven’t had it in forever. YUM! I want these for dinner! Great SRC post, happy to be a part of the club with you! 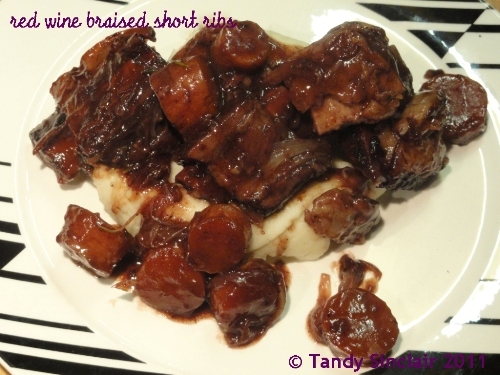 I loved braised short ribs… and these look like they are fall off the bone tender! Fantastic SRC post, thanks for sharing! If I were a meat-eater, I’d be making those tonight! If you haven’t already, I’d love it if you’d check out my SRC recipe for Crockpot Apple-Cinnamon Oatmeal. These short ribs need to be cooking at my cottage right now, they look delicious. We are going to love them. This is a great pick for the SRC! Thanks for sharing and have a wonderful week. I love that you hit the random button. Boy did you luck out these look incredible. I’ve made red wine braised short ribs (A. Burrell’s recipe), and it was AMAZING! Needless to say, I’m convinced the recipe you made was equally amazing – who doesn’t like braised short ribs? Now I’m hungry for lunch!! I hope you’ll stop by and visit my SRC post for Honey Vinaigrette Marinated Grilled Chicken. They look and sound gorgeous – all that finger licking and slurping of the sauce! I think I can smell this all the way over here! Fabulous recipe and a perfect comfort, cooler weather dish! Thanks for sharing! Visit me at http://raisingdieter.blogspot.com/ for recipes and a giveaway! These sound delicious! Short ribs are one of my favorite things to cook on a Sunday afternoon, so I will have to bookmark this recipe for the future! Mmmm…. I think I can smell it way over here! This is fabulous and such a wonderful, cooler weather comfort dish! What a great random pick Tandy – awesome recipe! It would go down a treat with this STILL cold and horrid weather we are having here. Really loved this blog. The red wine is prfectly complementing this dish! Sounds yummy! Tandy, the ribs look fantastic. I’ve never cooked with arrowroot before so I’m eager to try it out when I have access to it. Oh, my… YUM! Those look amazing! I have got to try these. Thanks for sharing! Those look fantastic! My husband has been asking for short ribs for months but I’ve been avoiding them since they seem so complicated. I think this recipe is perfect! Mmm! There is just something about wine and beef that is the besty combination!